The Islamic militant group known as ISIS remains the American public’s top international concern. Overall, 80% say ISIS is a major threat to the well-being of the United States, while 16% say it is a minor threat and 3% say it is not a threat; views are little changed from December. Cyberattacks from other countries rank second on the public’s list of global threats: 72% say they are a major threat, while about two-thirds (67%) view global economic instability as a major threat. Six-in-ten Americans (60%) view the rapid spread of infectious diseases from country to country as a major threat, up somewhat from 52% in August 2014 (in the midst of the Ebola crisis). The large number of refugees leaving countries such as Iraq and Syria is seen as a major threat by 55% of Americans. About the same share (53%) say global climate change is a major threat, little changed from December. China’s emergence as a world power is viewed by half of Americans (50%) as a major threat, while 42% say tensions with Russia present a major threat to the country; perceptions of both China and Russia’s threat to the U.S. are on par with public opinion in December. There continue to be wide partisan and ideological differences in views of the top global concerns for the U.S. Overall, Democrats – particularly liberal Democrats – are less likely than Republicans to see many of these issues as a major threat to the country’s well-being. Climate change is the only one of these issues that is seen as a major threat by a greater share of Democrats than Republicans. ISIS is viewed as a major threat by overwhelming majorities of conservative Republicans (93%), moderate and liberal Republicans (88%), and conservative and moderate Democrats (87%). Though ISIS tops the list of threats for independents as well, somewhat fewer (76%) say it is a major threat to the well-being of the U.S. And among liberal Democrats a sigificantly smaller majority (64%) say it is a major threat. By contrast, global climate change tops the list of major threats among liberal Democrats: Fully 81% in this group view it as a major threat to the U.S., a far greater share than say this about any other threat asked about on the survey. Nearly as many conservative and moderate Democrats consider climate change to be a major threat to the well-being of the U.S. (75%), though it ranks alongside other threats and behind ISIS among this group. Far fewer independents (52%) and moderate and liberal Republicans (41%) see global climate change as a major threat to the country; and conservative Republicans are particularly unlikely to see climate change as a threat – just 18% say that it is. This gap in partisan and ideological views of global climate change as a major threat is unchanged from last December. There are also wide partisan gaps over whether the large number of refugees leaving countries like Iraq and Syria poses a major threat to the U.S.: Eight-in-ten conservative Republicans (80%) view this as a major threat, compared with 61% of moderate and liberal Republicans and roughly half of both independents (55%) and conservative and moderate Democrats (49%). Just 30% of liberal Democrats see these refugees as a major threat to the well-being of the U.S.
Liberal Democrats are also the least likely to view China’s emergence as a world power, tensions with Russia and global economic instability as major threats to the U.S. There are more-modest partisan and ideological differences in perceptions of the threat of cyberattacks from other countries, global economic instability or the rapid spread of infectious diseases from country to country. 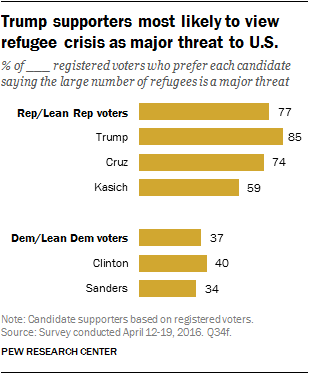 Though a majority of Republican and Republican-leaning registered voters view the large number of refugees leaving countries as a major threat to the nation, this view is more widespread among those who prefer Donald Trump in the contest for the GOP nomination. Fully 85% of Trump supporters say the large number of these refugees is a major threat. That compares with 74% of those who back Cruz and 59% of Kasich supporters. Among Democratic and Democratic-leaning registered voters, Clinton and Sanders supporters are about equally likely to consider large numbers of refugees leaving Iraq and Syria as a major threat: Just 40% of Clinton supporters and 34% of Sanders supporters say this. There is no sign of growing public concern about either China or Russia. Roughly a quarter of the public (23%) views each as an adversary, while 44% say each is a serious problem but not an adversary. About three-in-ten say neither China nor Russia pose much of a problem for the U.S.
Over the past two years, there has been no rise in the share of the public that sees Russia as an adversary. More now say Russia is not much of a problem than did so in 2014, shortly after the country’s annexation of Ukraine’s Crimea region (30% today, 15% then). Views of China are little changed over the last several years. There are minor partisan differences in views for both countries. Though only about a quarter of Republicans (27%) say China is an adversary, they are somewhat more likely than Democrats (20%) to say this. 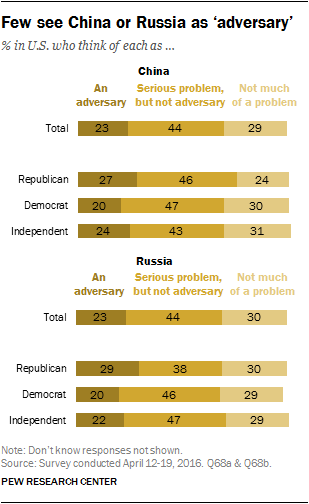 Similarly, while 29% of Republicans view Russia as an adversary, 20% of Democrats and 22% of independents say the same. 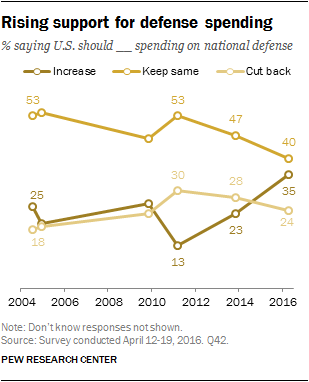 For the first time in more than a decade a greater share of Americans say spending on national defense should be increased (35%) than say it should be cut back (24%). A plurality (40%) say that spending should be kept roughly the same. In November 2013, the last time this question was asked, more Americans said we should reduce our spending than increase it (28% cut back vs. 23% increase). Support for increasing defense spending is particularly pronounced among Republicans – especially conservative Republicans. Today, two-thirds of conservative Republicans (67%) favor increasing the defense budget, up 28 percentage points from when the question was last asked. 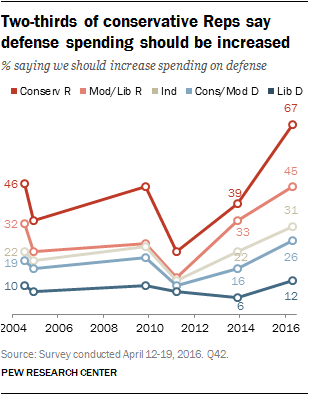 The share of other partisan groups saying defense spending should increase has also risen, although somewhat more modestly. There are wide partisan and ideological differences when it comes to national defense spending. Though most conservative Republicans (67%) think defense spending should be increased, moderate and liberal Republicans are more divided: 45% say the national defense budget should increase, 39% say it should stay the same, and 14% think it should be reduced. Only 20% of Democrats say there should be more spending on defense; 30% say the defense budget should be cut back, while roughly half (49%) say it should remain near current levels. Conservative and moderate Democrats are about equally likely to say defense spending should go up (26%) as to say it should be cut back (22%), though roughly half (51%) say it should remain about the same. Liberal Democrats, in contrast, are about three times as likely to say defense spending should be cut as to say it should be increased (39% vs. 12%); 48% say it should be kept the same. Among Republican and Republican-leaning registered voters, those who support Donald Trump (66%) and Ted Cruz (64%) in the primary contest are somewhat more supportive of increasing the defense budget than are backers of John Kasich (52%). Among Democratic voters, roughly as many Clinton supporters say defense spending should be increased (21%) as say it should be decreased (25%), while 52% say it should be kept at about the same level as current spending. Bernie Sanders supporters are more likely to say spending should be cut back: 43% say this, while nearly as many (39%) say spending should be kept about the same; just 16% say it should be increased.